I've long appreciated Randy's book Money, Possessions and Eternity, and that book, more than any other, has shaped my thinking about this topic. I first read it back in the mid 1990's and have recommended it to a number of people throughout the years. However, because of its lengthy nature, it's not very easy for people to pick up and read. 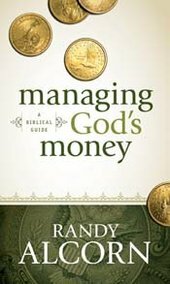 So I was thrilled when I saw Randy's new book Managing God's Money. I quickly got a copy and after thumbing through it, I ordered 1,200 copies to pass out at our church for a financial series we were beginning soon. We matched up the six sections of Managing God’s Money to the six message topics in the sermon series on finances. We created a bookmark and placed them in the books with each week's reading assignments on it. We then created a two-page study guide for all of our small groups that utilized material from Randy's book. We also created a leader's guide for the material. For people who were not in a small group, we offered night classes during the week. Because of the inexpensive nature of the book, there is no reason every church in America couldn't do what we've done. I pray the truth of Scripture on this topic settles deep in the hearts of Christians everywhere. In Managing God's Money, Randy Alcorn breaks down exactly what the Bible has to say about how we are to handle our money and possessions in a simple, easy-to-follow format. Filled with Scripture references, this book is the perfect reference tool for anyone who is interested in gaining a solid biblical understanding of money, possessions, and eternity. Available from EPM for $4.79 (retail $5.99). Discounted price of $3.59 when you order 2 or more; $3.00 per book when you order 52 books or more. A couple months ago, I read a review written by David Wills about my book Managing God’s Money. David is a great brother, and the president of the National Christian Foundation, the largest Christian grant-making foundation in the world. In a recent radio interview, Randy was asked about his forthcoming book (now available), Managing God's Money.